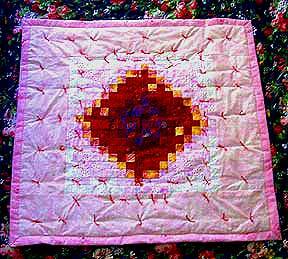 This is a baby quilt that I made in 2003. It’s made with over a dozen fabrics, each 100% cotton. Each square in the quilt–and there are hundreds of them–is about 1″ x 1″. It could be very tedious to make a quilt like this, but the top created with strip piecing. This is a faster technique that works with strips of fabric, cut after they’re sewn together. Cutting, sewing, and ironing the top took about six hours, total. The technique comes from a fabulous book, Strip-Pieced Watercolor Magic: A Faster, New Approach to Creating 30 Watercolor Quilts. The book gives precise directions for selecting fabrics, and how much of each for the 30 projects in the book. I selected the fabrics using a piece of clear red plastic. I modified the design from a pattern for a full-sized bed quilt, to create this small baby quilt for a newborn. I use blanket-style, needlepunched quilt bats for quilts. They cost a little more, but hold up better in the laundry. Generally, I tie baby quilts rather than quilting them. Baby quilts are laundered often and the batting starts to fall apart. With a tied quilt, you can simply undo the yarn or embroidery floss (used to tie it), discard the quilt batting, replace it with a fresh layer, and retie the quilt.